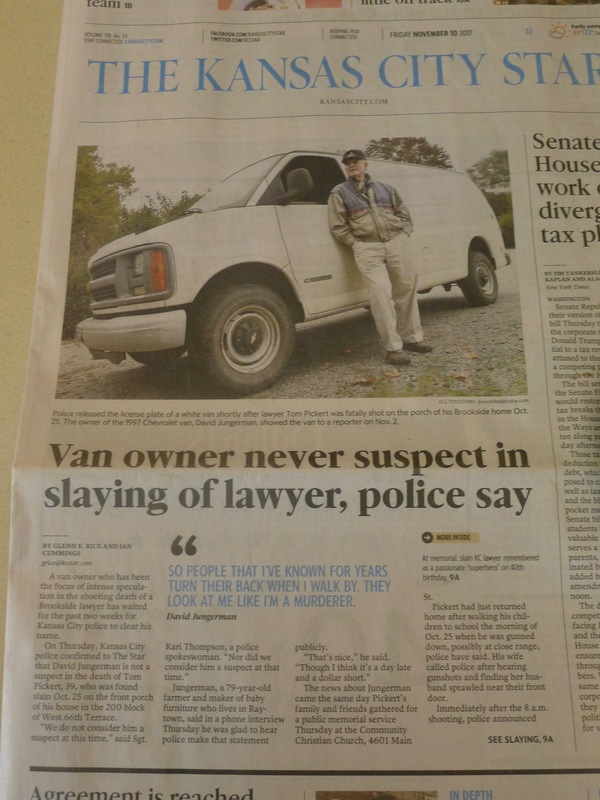 It’s unusual for a non-investigative news story to help solve a murder, but that could well be the case with a story The Star published early in the wake of the Thomas Pickert murder case. Like a lot of people, I was amazed at that headline and story because it flew in the face of logic: Jungerman not only had to be a suspect in Pickert’s murder, he was, in all probability, the only suspect. He was the only person who had motive, opportunity and a known propensity for settling disputes with gunfire. It was also outright untrue. As I wrote back in November, two sources — both defense attorneys — told me Jungerman was the one and only suspect. They also speculated that police were putting out the “not a suspect” line to lull Jungerman into a false sense of security while they continued digging up evidence and trying to develop a chargeable case. In fact, that’s exactly what was going on, and the strategy worked. The investigators knew — as most of us watching the case and learning about Jungerman suspected — Jungerman is only capable of thinking in short bursts, and not very far ahead. In fact, he usually acts before he thinks, which is why he was charged with a gun-related felony in southwest Missouri long before Pickert was murdered and why he was charged with additional gun-related felonies in Jackson County before police solved the Pickert murder. The exception to his act-first, think-later approach was the Pickert murder. He did have a plan there, although it was a poor one. After all, he drove his own van to the scene in broad daylight; was seen well enough by one witness that the witness was able to provide a good description of him; and afterward, while he apparently got rid of the gun, he failed to get rid of a live bullet that matched the caliber of the relatively uncommon weapon he had used — a .17-caliber rifle. He also regaled the reporters with stories of his gun-related adventures, including two 2012 incidents, about a month apart, in which he shot a total of four people. After the interview, he went on bragging and running his mouth for another five months, during which time detectives were painstakingly developing evidence and waiting for him to slip up. That was almost inevitable, and it happened, and now he’s behind bars, with plenty of time to reflect on his greatly shortened horizon and the many occasions he should have thought more and acted less. I read in the star that Jungermann’s net worth is believed to be around $33 million. Surely there will be a civil suit coming from Pickert’s family for wrongful death. I really hope they get every last dollar Jungerman has, although i’m sure a lot of it is potentially protected by trusts. Yes, he moved a lot of that money around and removed himself as executor of the trust…That’s where he did most of his forward thinking. I would think that it would depend on when the trusts were established. If they were established after his legal troubles began I would suspect that there would be little difficulty setting them aside. For phony corporations, I believe the process is referred to as “piercing the veil” and I assume there’s a similar process for setting aside trusts that are established simply to avoid legitimate legal obligations. I just saw that The Star’s “Why so secret, Kansas?” was a finalist for a Pulitzer Prize in the public service category. It apparently finished second to The New York Times and The New Yorker for their coverage of the sexual abuse of women in Hollywood and elsewhere. The closest midwestern paper that won a Pulitzer was the Des Moines Register, for examining the consequences of Iowa’s privatization of Medicaid. Investigative journalism, go figure. How many Pulitzers has the new editorial board won? Pulitzers are extremely hard to win. Two of the new editorial writers have won significant awards, however. The same month, Dave Helling was named the winner of The American Society of News Editors’ 2018 Burl Osborne Award for Editorial Leadership. The award recognized writings that called into question the way Kansas City’s government handled contract negotiations for a $1 billion air terminal being planned at Kansas City International Airport. I know that doesn’t impress you, John, but I don’t think the editorial page won any comparable honors when they were down to one editorial writer. True, you know my biases. I believe that editorial writers are an anachronism, good, bad, conservative, or liberal, that most papers can no longer afford. Far better to hire more journalists to do what us peons can’t do and that’s create original news stories. I applaud The Star’s team for their work on governmental transparency. The KCPD could do the public a big favor: Provide us with clear, concise definitions of “suspect” and “person of interest.” By any common-sense definitions, Jungerman had to fit at least one of those words. We’ll never see that, Mark; they want to keep it loosey-goosey and be able to adjust case by case. As you know, they did the same thing with the Indian Creek killer. They had video of a guy walking in the area about the time of the Darby murder, and they said they wanted to talk to him because he might have information. They said he was not a suspect. Turned out, of course, he was the guy. Mark, Bad guys are bad guys because they think they’re smart enough to get away with it. Jungerman is the perfect example. He couldn’t wait to run his mouth once they said he wasn’t a suspect. Thanks for the tape, David.